We’ve spent time looking at goals, making them S.M.A.R.T. and not being afraid to make them big…turning our dreams into goals to watch them come true. Confidence abounds as we look ahead at our clean slate believing we can accomplish what we set our minds to. As exciting as making goals and resolutions can be the newness quickly wears off and the fun turns to monotony as it sinks in that this is going to be work. That is when many of us just give up. In fact, it is so common to give up resolutions that January 17th is declared “Ditch New Year’s Resolutions Day”. We need to be intentional in maintaining our focus. By setting aside time at least once a week to refocus on our goals – how we’re coming and where we need to tweak things we keep them before us and keep it real, so to speak. Post scripture around your home, in your car, at your workplace — wherever it will remind you. Write it on index cards, print it out on the computer or make it fancy. The method doesn’t matter, just get it in front of you. When you can’t bring it to mind it will be there in front of you. I pray that out of his glorious riches he may strengthen you with power through his Spirit in your inner being. Whether you use a vision board like I mentioned in a previous post (find it here: https://pauladavispeace.wordpress.com/wp-admin/post.php?post=901&action=edit) or another method, keep your goals in front of you. I used to use a 3-ring binder exclusively for my goals but found that I didn’t look at it! I still have that binder for the S.M.A.R.T. goal sheets I use but now I also keep photos and notes in a place where I’ll see them every day. They remind me not to give up or hide the goals away where I lose sight of them. 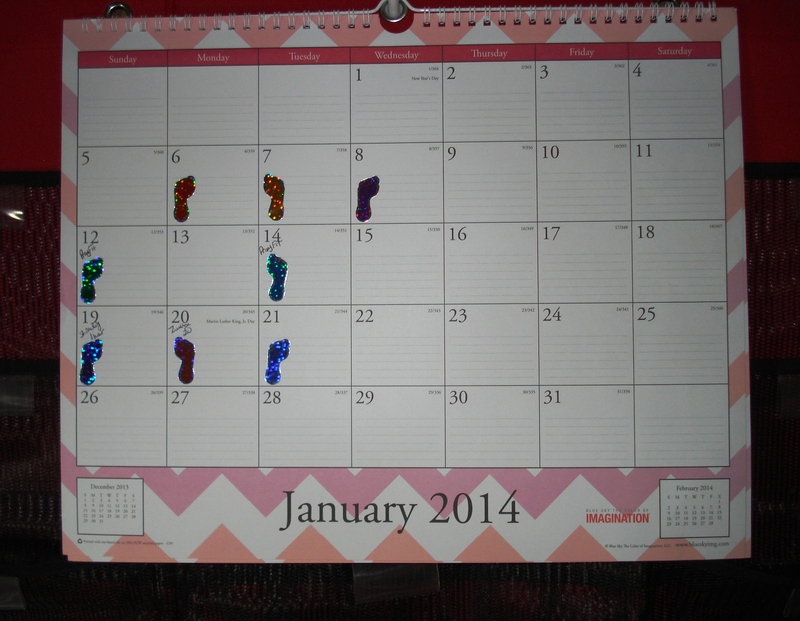 I have a calendar where I mark every day that I exercise. I found some bright feet stickers and put one on every day I work-out. There is actually a little thrill when I put that sticker on, but even more encouraging when I glance at it and see consistency. The calendar also kick-starts me when I see too many blank days, reminding me that I need to get with it again. If you’re working a losing pounds, perhaps a count-down scale posted where you will see it. Write the number on the scale each week. When it’s lower you will smile each day you see it. If it went up it will push you to work harder to see it go down again. Whatever you do, don’t give up!! 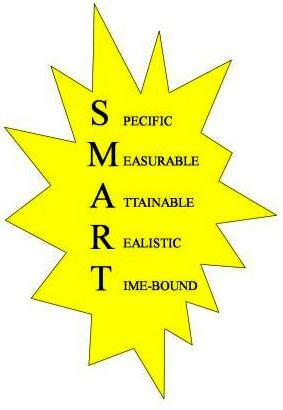 Are Your Goals S.M.A.R.T. ? So you’ve got dreams, and you want to turn them into goals and see them come to life. But goals can be intimidating. If they’re big goals they may seem unreachable or even impossible. You may want to quit before you even get started. This is why your goals need to be S.M.A.R.T. Now I’m not suggesting that your goals have an IQ or that they are good or bad. S.M.A.R.T. is a formula of sorts that not only helps you reach your goals, but also determine if your goals are realistic — reachable! Really, this formula isn’t any different from making a “To-Do” list. For example, when you list things you want to accomplish in a weekend most likely they meet each of these criteria. *What: What do I want to accomplish? *When: Establish a time frame. *Which: Identify requirements and constraints. *Why: Specific reasons, purpose or benefits of accomplishing the goal. MEASURABLE – Establish concrete criteria for measuring progress toward the attainment of each goal you set. When you identify goals that are most important to you, you begin to figure out ways you can make them come true. You develop the attitudes, abilities, skills, and financial capacity to reach them. You begin seeing previously overlooked opportunities to bring yourself closer to the achievement of your goals. REALISTIC – To be realistic, a goal must represent an objective toward which you are both willing and able to work. 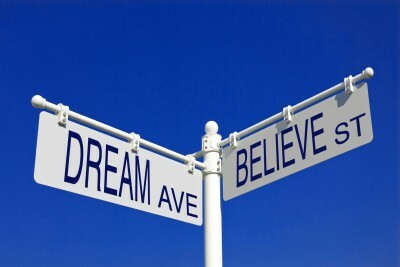 A goal can be both high and realistic; you are the only one who can decide just how high your goal should be. TIME-BOUND – A goal should be grounded within a time frame. With no time frame tied to it there’s no sense of urgency. 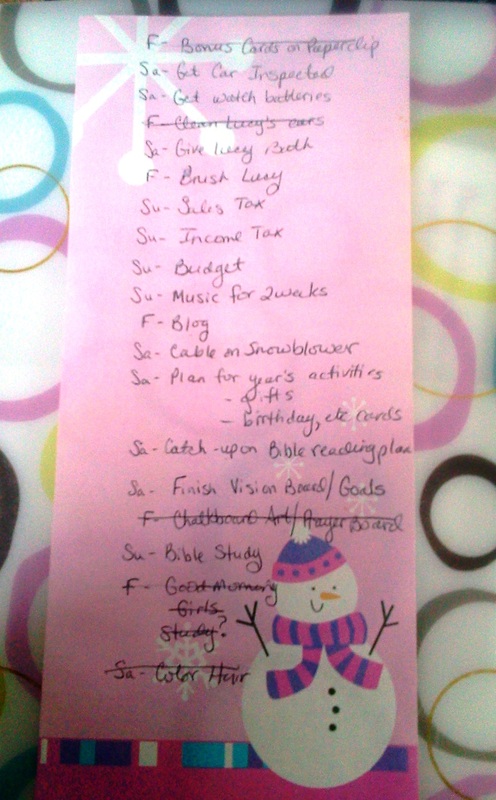 A “To-Do” List consists of specific tasks that can realistically be accomplished in a day, weekend, etc. Grander goals usually require a longer time-period and may need a few smaller goals to reach them. Attainable – By changing eating habits and increasing exercise. Realistic – The number fits within a healthy weight for my body-type so it is realistic. This is not an easy goal and the big number looks very difficult to attain. Breaking it down to weekly/monthly goals makes it less intimidating and by keeping my eyes on the smaller ‘prize’ will make me more likely to stick with it. To help me reach this huge goal I am also setting goals related to exercise, spiritual ‘fitness’ and encouragement to compliment it. Sometimes reaching the ultimate goal is not reward enough and we need some encouragement along the way. Rewarding ourselves for sticking to the new disciplines required to reach our goals and encourage us along the way. I have developed a goal worksheet that I use when setting goals. If you’d like a copy, comment here, or e-mail me at pauladavispeace.com. I’ll be glad to share them. Goals can be fun to make and when they are attainable (even with some hard work sometimes) we are more likely to find success. There I will provide tips for sticking with our goals and encouragement that I find along the way. Together we can accomplish our goals and bring more peace to our puzzle called life. blessings & peace to you! It’s the time of year for resolutions. As 2014 dawns do you find yourself resolving to change things in this brand new year? I’ve been thinking about resolutions and how they are closely related to our habits. We resolve to lose weight, save more money, be kinder to those around us…there are so many common resolutions. So we begin the year with good intentions and dive head-first into all the things we feel we need to change. 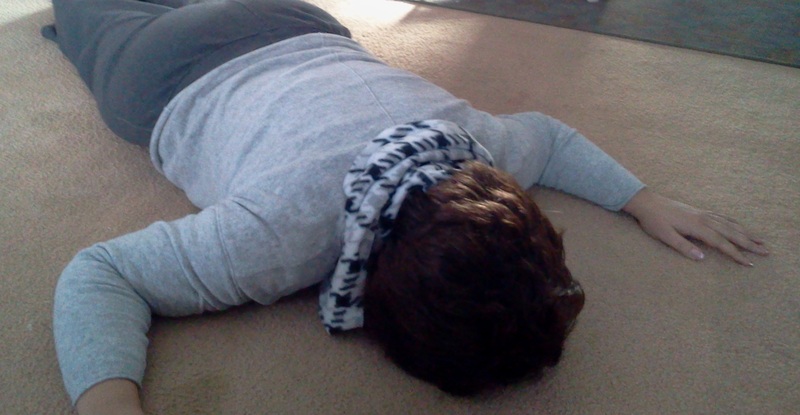 And then most of us fall on our faces a few weeks later. Because our resolutions are directly related to our habits. And habits are hard. New/Better habits are hard to make. It’s really not as easy as writing something down on paper and declaring you will do it. It is said that it takes 21 days to make a habit and 21 days to break a habit. Intention and practice are required just like when we learn a new skill or hobby. Most of us could not pick up knitting needles and make a scarf in a couple of hours but experienced knitters can. Without winning the lottery or receiving a big inheritance people must work at building up a savings account. It comes by practicing restraint and saying “no” when we’d like to say yes more often. Ease into something new. If you don’t exercise regularly don’t attempt to get up every morning and work out for an hour. Start with 3 or 4 days of exercise and when you’ve conquered that add another day or two. When/if you mess up just pick up where you left off. Don’t throw in the towel in February because you haven’t done as well as you hoped. Looking back to see SOME progress is better than no progress at all because you gave up partway through. Find someone to cheer you on. You don’t have to broadcast your goals/desires/resolutions for everyone if you don’t want to, but having someone to cheer you on and keep you on track can be essential for success. We should all have a cheerleader as well as a drill sergeant and a shoulder to cry on. Happy New Year to you all! I pray this year holds more blessings than you can count. Are you making resolutions this year? If so, will you share them with us? In my next post we’ll look at setting goals and planning for the year ahead.